Co-Optimus - News - Why Did Microsoft Choose Ruffian over Realtime Worlds for Crackdown 2? It's quite surprising sometime the politics that go on behind the scenes of game development. For a hobby that brings so much joy to people, you'd think things could go smoothly on the back end. That's not always the case. When Crackdown 2 was announced, and announced in development by upstart Ruffian Studios, well you can imagine Realtime Worlds wasn't happy. “When Billy Thomson, the lead designer of the game, left Realtime Worlds there was an opportunity,” he said. Makes perfect sense. The guy that created and founded the direction of the game is major piece to the puzzle, with him no longer at the studio it would almost be a risk to not follow him. But Microsoft did have a good working relationship with Realtime, and that was something they didn't want to damage. But another factor came into play - timing. “But at the same time, I consider Dave Jones [CEO of Realtime Worlds and creative director of the first Crackdown] a good friend, and think APB is brilliant – and I didn’t want to undermine that studio. With that in place Microsoft was given a tough decision, since they own the Crackdown IP. In the end Ruffian was chosen due to the timeframe that Microsoft wanted to have the game released in. 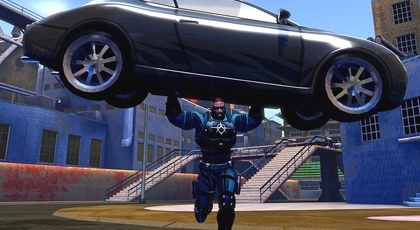 Its good news for gamers, because that means we could see four player co-op Crackdown 2 next year rather than even later.